During the mid-1960s, Hammer Films briefly diverged from its Frankenstein and Dracula series to produce a quartet of underrated little chillers: Kiss of the Vampire, Plague of the Zombies, The Reptile, and The Gorgon. All four films featured strong casts, impressive set design (amazingly done on a modest budget), and first-rate technical credits. While Vampire has gained the most fame over the years, The Gorgon has remained largely forgotten. 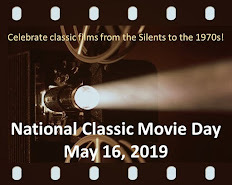 In truth, it never received due respect, not even when Hammer first released it as a double-feature with the vastly inferior Curse of the Mummy's Tomb. Set in the European village of Vandork, The Gorgon opens with a young painter named Bruno learning that his model/lover, Sascha, is pregnant. When Bruno storms out to discuss his intentions with Sascha's father, she follows him. Weaving through the woods on a bright moon-lit night, Sascha passes near Castle Borski where she sees something horrifying--even as she screams, she cannot refrain from looking at it. The next day, Dr. Namaroff (Peter Cushing) of the Vandorf Medical Institution prepares to examine Sascha's body. As the sheet-covered corpse is wheeled into the laboratory, a gray-colored hand brushes against an iron basket--and a finger breaks off like a piece of plaster. writtes a letter of warning. However Namaraoff doesn't mention this incident at the inquest. He implies that Sascha died at the hands of Bruno, who was subsequently discovered to have hanged himself. The coroner rules it a homicide and suicide...a tidy decision for everyone except Bruno's father. He is determined to proves his son's innocence and, in the process, explain why Vandorf has been the site of seven unsolved murders in the last five years. Running a snappy 83 minutes, The Gorgon generates a genuinely creepy atmosphere where much is left to shadows, reflections, and one's imagination. Interestingly, director Terence Fisher's early work (such as Curse of Frankenstein) has been criticized for its emphasis on visual horror. That's not giving Fisher proper credit; he was a polished craftsman who adapted his style to fit the film. The Gorgon is a low-key film and its best scenes achieve an eerie, other-worldly quality, such as when Bruno's father enters Castle Borski--a withered collection of stones, its floors covered with pigeons and dead leaves that swirl as the whistling wind cuts through the structure. If there's a connection to Fisher's earlier work (he's considered an auteur in France), it's a pervading sense of gloom. No character is safe and it quickly becomes evident that there's a strong likelihood of a downbeat ending. In Fisher's films, the heroes sometimes perish or, if they survive, they are scarred by their experiences. It's no surprise that Victor Frankenstein, the "hero" of Hammer's Frankenstein films--most of which were directed by Fisher--is also a villain. 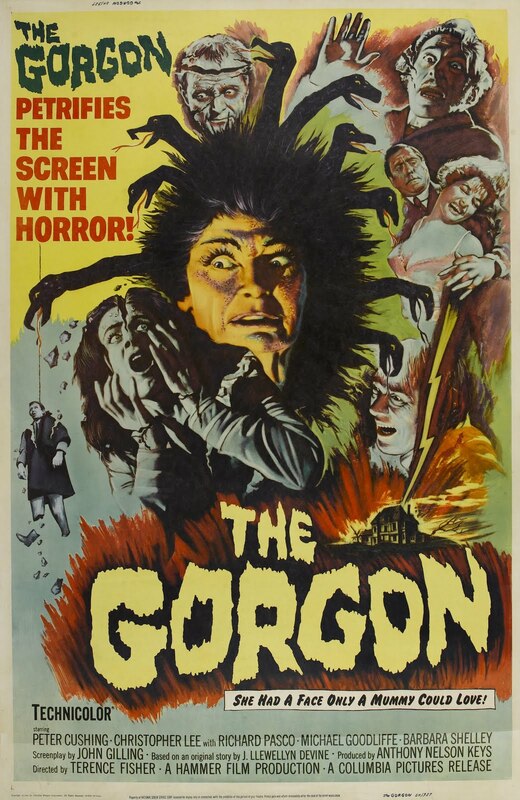 The Gorgon benefits from a solid cast, led by the always-reliable Cushing and the talented Barbara Shelley in one of her meatier Hammer roles. Richard Pasco as the nominal hero and Michael Goodliffe as Bruno's father are both convincing in supporting roles. Christopher Lee makes an appearance well into the film, as if Hammer thought The Gorgon needed more star power. John Gilling, a Hammer veteran, penned the screenplay from a short story by J. Llewellyn Devine. He claimed his original screenplay was altered by producer Anthony Hinds. Even so, what remains is an above-average script with one puzzling part. The three Gorgon sisters are identified as Medusa, Magaera, and Tisiphone. However, in Greek mythology, Medusa is the only one of that trio who is a gorgon; Magaera and Tisiphone were two of the three Furies (or Erinyes), whose heads were also adorned with serpents. Magaera, when she is shown in The Gorgon, looks less than impressive. Fortunately, her appearances are few and do not detract from the film. For while it may not rank with Hammer's finest horrors, such as Brides of Dracula, The Gorgon is a sharp little film that relies on mood and a sense of dread to create a memorable viewing experience. Great post, Rick, and one of your best. I think THE GORGON is one of the underrated Hammer films. With Fisher as director and Cushing and Shelley as stars, it'd be difficult to not make a terrific movie. But as you suggested, it's wonderfully atmospheric and, I think, often spooky. You mention this, but one of my favorite sequences is when Magaera is slightly visible in a reflection; I agree that, when shown, she's a little disappointing, but when Fisher merely hints at her presence, it's quite effective. I often associate this film with another Hammer production, THE REPTILE. It's partly because I saw them together, but also because they're both well made chillers that many viewers, even Hammer fans, unfairly dismiss. But they (like most Hammer films) deserve respect and multiple viewings. Like you and Sark, I am a big Hammer fan. I'm tickled to see you do a good review on The Gorgon because it happens to be my favorite, even of all the wonderful films Hammer made. I'm not sure exactly why, but your description has hit on most of the points that attract me to it -- the atmosphere, shadows, sense of doom. When the unfortunate father begins to turn to stone, it is really chilling. I felt that the music and vocals gave a strong sense of the impending doom. It is true that the actual clear and close-up Gorgon face and snake hair were pretty cheesy and should have been left in half-shadow. I remember reading somewhere that they were going to try to weave real snakes into Shelley's hair, but it didn't work and she was too pretty anyway. So they hired another actress -- poor thing, how awful to be hired because you are ugly enough to play the Gorgon! You have a good point about saying that Magaera was not actually a gorgon, but a Fury. I suppose they figured people would have instant recognition of the name Gorgon rather than Fury. Whatever they called it, I just loved it! Great post, Rick! I don't know why but I find myself humming that song "Turned to Stone." "The Gorgon" is a classic and very atmospheric Hammer entry. I thought it was odd that they chose to call this character Magaera, rather than Medusa, too. In mythology, the Furies are three sisters who seek vengeance, and are sometimes depicted with snakes on their heads. If Magaera was motivated by retribution for infidelity, perhaps that is what sparked the deaths of Sascha and Bruno (who were not married.) This is probably a stretch but it is an attempt to explain the name choice. The well-shadowed settings add an abundance of atmosphere. The place with the stone steps and pillars where Magaera walks seems to suggest all three sisters and the destiny of those upon whom they gaze. Great post, Rick, and I really liked the comments posted by Sark and Becky, too. Oh, Rick, you and these Hammer films! I feel totally out of the loop, having not seen many of this studio's films. I don't know that this is my type of film, but I enjoyed reading your review.